The EXFO AXS-100 Access OTDR combines the leading OTDR technology of the industry, with power meter functionalities in one powerful handheld unit. Optimized for testing passive optical networks (PON) within FTTx architectures, it offers several wavelength configurations and a wide range of options, for first-class flexibility. Use it at the optical network terminal (ONT), drop terminal, or fiber distribution hub (FDH) for FTTH distribution (F2) fiber characterization, troubleshooting, and fault locating. FTTx networks are becoming a worldwide solution for offering high-speed triple-play services, as carriers must ensure the same level of reliability and availability as that of traditional twisted-pair copper-based access networks. Increased fiber deployment within access networks brings new requirements and the need for highly efficient testing strategies. As most of the work is performed in ever-changing outside conditions (cold/warm/hot, day/night, etc. ), working space is often limited and access technicians are getting acquainted with the latest FTTx technologies, choosing a simple, reliable testing tool is key. The AXS-100 Access OTDR is specifically designed for in-service PON troubleshooting. It features an optional dedicated port for testing at 1625 incorporating a filter that rejects all unwanted signals (1310, 1490 and 1550 nm) that could contaminate the OTDR measurement. 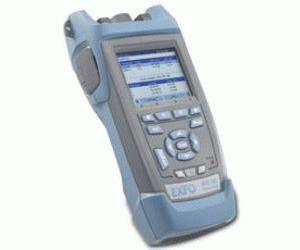 The filter only lets through the 1625 OTDR signal, ensuring accurate OTDR measurements. In-service OTDR troubleshooting of optical fiber does not interfere with the normal operation and expected performance of the information channels. The EXFO AXS-100 does not interfere with the CO laser transmitters, as it uses an out-of-band wavelength, as per the ITU-T L.41 (Maintenance Wavelength on Fibers Carrying Signals) recommendation.